Folk dance group Frunza is a group that performs and practices folk dances from the Balkans. Frunza comes from Helsinki, Finland. Folk dance group Frunza was founded in Helsinki, Finland in 1978. There was a course of international folk dancing at the Helsinki Adult Education Center. The participants decided to carry on after the course and founded a dance group of their own. The name of the group is a name of Romanian dance then in the program. The word Frunza is Romanian and means a leaf. From the times of these enthusiastic pioneers, the group has become a "serious" performing group which still has preserved the joy of dance. Folk dance group Frunza belongs to an organization called Helsinki International Folk Dance Club. It organizes dance work shops and weekend dance courses with foreign dance teachers and choreographers. Since the beginning group Frunza has had dancers with different nationalities, ages and languages. The oldest performing Frunza dancer has been 76 years and the youngest 2½ years. At the moment there is an age difference of two generations between the youngest and the oldest dancer. There are about two dozen dancers in Frunza. Folk dancing is a hobby of team work, not to mixed with politics or religion, although many of our dances come from regions not so peaceful at times. Folk dances are part of a rich culture that help us to understand different people. Most often we dance to recorded music, but we have been lucky to have a music group to accompany us. In recent years Frunza has worked with a group called Svirki Svirjat, which is a group, who can master even the most difficult Balkan rhythms. The line between musicians and dancers has not been strict: a part of the musicians have performed as dancers and vice versa. 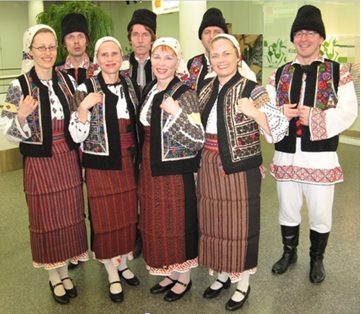 The dance program of Frunza consists of folk dances from the Balkans, i.e. Bulgaria, Romania, Albania/Kosovo, former Yugoslavia, and Hungary, as well as dances from Greece, Turkey, and Armenia. Some odd dances come from other countries. The dances have been taught by "guest stars" and choreographers at dance courses in Finland, the Netherlands, Sweden, Denmark, Germany or directly by local choreographers in the Balkans. The dance program of Frunza is wide, there are hundreds of dances. Part of the dances are traditional village dances, which are still a live tradition in many parts of the Balkans. Part of them are stage choreographs made of traditional steps and only a few of artificial, "composed" dances. The remembering of the dances is nowadays done by video recording, but nothing can beat footwork of your own. The colorful folk costumes are an essential part of a dance performance. Frunza has many different costumes, some original, some home made after original models. Also the male members of Frunza have taken part in costume making (even cross stitching). Folk Dance group Frunza practices once a week. Although Frunza is a performing group, there has not been many grand tours. The group performs 5 – 10 times a year. Check the practice times and place here. The principal leaders of the group at the moment are Inkeri Sippo-Tujunen and Ari Tujunen. Bahtir Kuqi and Marjo Kopra-Getov act also as leaders and as choreographers.